With their simple design, these great-value Centurion Toilet Cubicles place an emphasis on both durability and reliability. 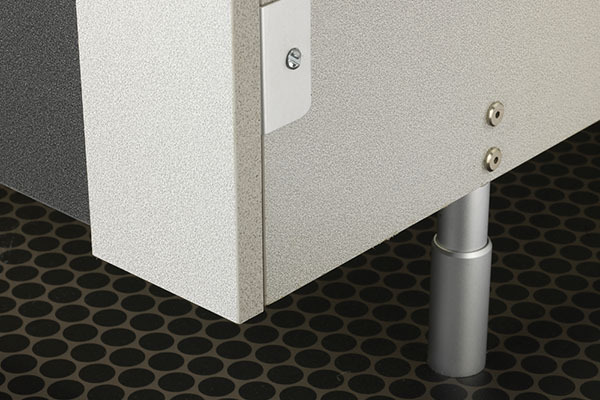 Centurion Toilet Cubicles are ideal for environments such as schools, bars and public buildings. This system is available for fabrication in any customised size and configuration. Manufactured from 19mm Moisture Resistant Melamine Faced Chipboard, all edges are sealed with 2mm PVC edging. Centurion Toilet Cubicles include all necessary corrosion resistant Satin Anodised Aluminium ironmongery. Centurion Toilet Cubicles can be manufactured using the widest selection of laminates, from industry suppliers including Formica, Polyrey and Egger. Rearo Centurion+ is similar to Centurion with superior specification: V313 MR chipboard faced both sides High pressure laminate (HPL) lipped all round in 2mm PVC edging. Vanity Units can also be custom built to match any laminate design and range.